I feel like a a wet blanket (or maybe, given the weather here, like a wet Northwest winter day) saying what I'm about to say, as all over America people brine their turkeys, greet their out-of-town guests, stock up on beverages and prepare for the great American celebration of food, family, friends, and abundance. I can't do it this year. I just can't. Instead I will spend this Thanksgiving fasting from sunup to sundown. I will spend the day in prayer, remorse, and grief for the 500-year ongoing genocide on this continent, most vividly represented by what is happening just north of the Standing Rock Sioux reservation as I write this. I will also spend the day in gratitude for the immense courage and resilience of the original peoples of this land, some of them camped out right now in the North Dakota winter, protecting the earth for all of us, surrounded by the full paramilitary might of the police. I will be praying for their safety and their victory, this unprecedented gathering on the plains of North Dakota of over 300 tribal nations. This week the Morton County police, in their ever-escalating violence against unarmed native people in prayer, turned water cannons in below-freezing weather on hundreds of people, soaking their clothes until hypothermia set in, firing rubber bullets at heads and limbs. Nearly 200 people were injured in one night. December 29th will mark the 126th anniversary of the massacre at Wounded Knee, South Dakota, where US soldiers killed close to 300 Sioux men, women, and children under their control, leaving many to die in the snow (and 20 soldiers received Congressional Medals of Honor for their part). Some of those who died were Hunkpapa Lakota from the Standing Rock area. These are the words of the famous Lakota holy man Black Elk, who witnessed the massacre: "I did not know then how much was ended. When I look back now from this high hill of my old age, I can still see the butchered women and children lying heaped and scattered all along the crooked gulch as plain as when I saw them with eyes young. And I can see that something else died there in the bloody mud, and was buried in the blizzard. A people's dream died there. It was a beautiful dream ... the nation's hoop is broken and scattered." The great Standing Rock leader and holy man Sitting Bull had been murdered by native police at Fort Yates on the Standing Rock reservation two weeks before the massacre, on December 14th, 1890, only 25 miles from where people are gathered on a bitterly cold night right now. Can we honestly believe that there these events are not connected, are not speaking to one another? The events of seven generations ago, police killing one of the greatest Indian leaders in North America, soldiers surrounding people who were actually complying with their orders and killing them in cold blood? And now descendants of Sitting Bull standing unarmed and nonviolent in front of North Dakota police officers in full riot gear, guns pointed at holy men once again? Traditional women on their knees praying while being tear gassed and shot? This must stop. We must find a different way forward, one that does not end with original peoples dying in the snow, does not end with another victory for American "progress" and the hoop of Indian nations broken again. One that does not end with death and more loss, for all of us. If Standing Rock is lost, something in us as a nation dies, the moral heart of our nation. So my fasting is for our nation as well. When I went to Standing Rock earlier this fall, I went partly because I sensed that something important was happening there, a new way of being, the rising up of native peoples out of the ashes of nearly successful genocide, joined by thousands from around the world in a new wave of solidarity and hope. And that's the way it felt there, the most life affirming, spiritual, powerful event perhaps of my lifetime. But we are doing it again. It looks like we are playing out the old story again, of cowboys and Indians, of the soldiers with their guns and the people of the land in the snow. The story that played out in thousands of ways all across this place we now call home, that we celebrate each Thanksgiving. If I'm wrong, and history changes its tune, I will be happy to join the festivities next year, the tables groaning with goodness. Until then, I take heart and inspiration from this video by a young woman of Diné (Navajo) and Tsétsêhéstâhese (Cheyenne) lineages, Lyla June, who reminds us, "We are fighting to replace our fear with love....The only weapons that are useful in this battle are the weapons of truth, faith, and compassion." I want to close with my prayer. I hold you and all those that surrounds you in my heart on this day. May that beautiful prayer find its way into the heart of this nation! Mni Wiconi! I join you and others who fall to our knees in grief at what has been done, what is being done to Original Nations and Peoples. I join with you and others to stand to Protect the lands, the waters, all life, and to stand With the Protectors at Standing Rock and elsewhere. All Nations Rise, All People Rise! I will be sharing a fancy meal with family today, but since I'm the one who says grace I will include Standing Rock and the 500+ broken treaties. Sometimes it's great to be an old lady! Thank you for your compassionate words, Florence. This is a sorrowful time. Thank you, Florence. Deep thanks. I didn't celebrate either. My family went to church to eat, and forgave me for being a wet blanket. Thanks Florence. My daughter is going to Standing Rock tomorrow to support the goals of the tribes. I am grateful for your Thanksgiving day thoughts - a welcome reminder of what has been done to the original tribes over many years. Thank you. Your message really puts into historical perspective what is happening today, under our watch. Seems we are witnessing a collision of materialism and waste, with life and spirit. Hard for the two worlds to connect, unfortunately. Florence, Thank you for a beautiful yet sobering piece. May we follow the lead of our First Nations and take a stand for Mother Earth. This goes way beyond Standing Rock. 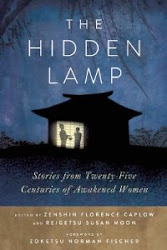 The Hidden Lamp: order now!